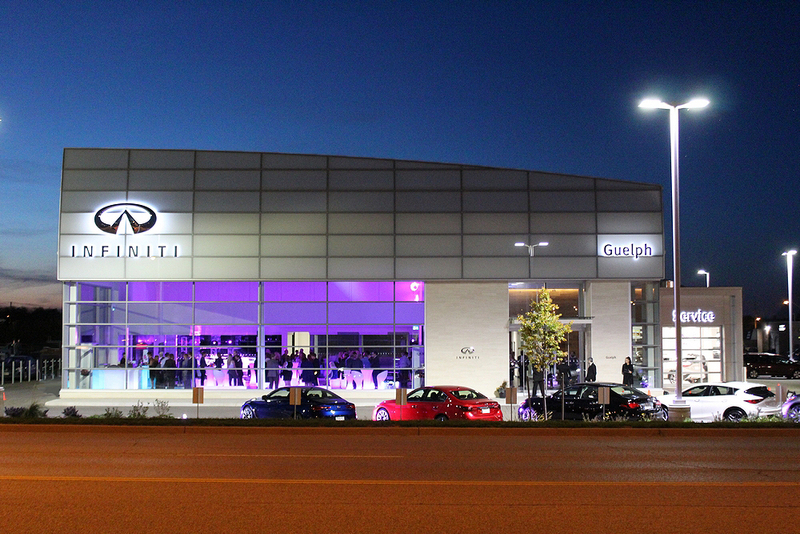 GUELPH INFINITI : Excellence beyond compare, year after year. That’s the essence of Guelph Infiniti. Our formula for satisfaction is simple: combine exceptional vehicles and exceptional staff The end result? An award-winning dealership in the heart of Guelph that has exceeded expectations since 1980. Our ever-evolving history of excellence includes your automotive future. Serving the Guelph area, Guelph Infiniti, located at 943 Woodlawn Rd W in Guelph,ON, is your premier retailer of Infiniti and Pre-Owned vehicles. Our dedicated sales staff and top-trained technicians are here to make your auto shopping experience fun, easy and financially advantageous. Please utilize our various online resources and allow our excellent network of people to put you in your ideal car, truck, SUV, crossover or commercial vehicle today! Guelph Infiniti is the recipient of the Infiniti Master Elite Award 2010. Presented by Infiniti to only the top retailers in the country. Our dealerships commitment and dedication in outstanding sales and performance is the center of what Infiniti embodies. From before you even walk into our showroom to long after you drive home, all of our customers here at Guelph Infiniti are customers for life. Being car-owners ourselves, it’s only fitting that we’d provide our drivers with the kind of courtesy, service and respect that we would expect. It all start with our extensive lineup of fabulous new and used Infiniti models. Whether you’re looking for something for the whole family to enjoy or something to spice up your daily commute, the world is your oyster when you consider the lineup of vehicles we carry. And thanks to the car loan and Infiniti lease options that are available throughout the year, it’s never been easier to get behind the wheel on your terms. From there, the experts in our car service and maintenance department will be there to make sure that your vehicle will continue to run as smoothly as it did on Day One. Or if you’re looking do some upgrades with the latest and greatest Infiniti parts on the market, you can trust the experts at Guelph Infiniti cover your automotive needs. The service never stops once you visit us here at Guelph Infiniti. There’s never been a better time to drop on by at our dealership here in 943 Woodlawn Rd W Guelph, Ontario, proudly serving drivers from Waterloo, Kitchener, Cambridge, Hamilton and Niagara region. We’re very much looking forward to it. Call us at 519-515-1400.